We are HAPPY announce the addition of the FROG STREET curriculum to our program. Please visit the frogstreet.com webite to read more about this comprehensive, research-based program that integrates instruction across developmental domains and early learning disciplines. The program is engaging for both teachers and children and is easy to implement! Children at Imagination Island play to make sense of their world, to learn more about themselves and each other, to develop language and to express themselves. As always, the core is “the heart” and making it joyful. Please take a look at our curriculum overview below, or click Enrichment Programs to skip to the bottom and read about our additional learning initiatives. Through Literacy activities and print-rich classrooms, children develop a passion for literature and begin to understand the many values and uses of printed text. Children will learn to express themselves in groups, verbalize their feelings, ask questions and progressively use more complex sentences. They will learn about books, build their vocabulary, learn about various alphabets, and take their first steps toward writing. At age four a child can begin sounding out and spelling simple words. Pre Math explorations and manipulatives allow children to develop understandings of numerals, shapes, patterns, measurement and logical thinking. Children will learn numbers, counting, matching, classification, and geometry through age-appropriate materials and activities where they will find themselves having so much fun they will forget they’re learning. Science and discovery-based activities, woven throughout the curriculum, fulfill children’s innate need to explore, discover, and draw their own conclusions based on observation. By developing and practicing these skills, children at Imagination Island build the conceptual foundations for their academic endeavors and beyond. An appreciation of cultural similarities and differences is expressed through the study of History and Geography. The children work with small globes and puzzle maps to become familiar with the names and locations of the world’s continents, oceans and countries. Stories from other lands are read and songs from around the world are sung throughout all age groups. The science of Cooking is fascinating to all children. They love to see their cupcakes double in size as they bake or watch as Jell-O turns from a liquid into a jiggly solid. Once a week your child will create his or own food treats. They may bring them home for you to taste! Don’t say we didn’t warn you! 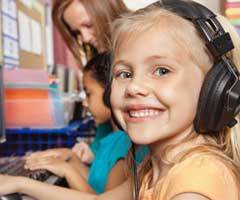 Children are naturally creative and derive much pleasure from involvement in the Arts. They learn a host of skills and acquire tremendous self-esteem when given varied opportunities to create. They get messy, but that’s part of the fun! 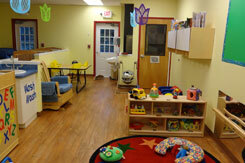 Our children will use a wide array of art media including finger and water paints, pastels, crayons and markers. These masterpieces will be displayed throughout the school to create a sense of pride. On your mark, get set, GO! 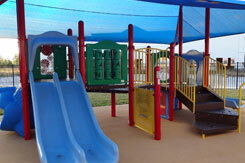 Children participate in outdoor play in our well-equipped playgrounds. Here children develop large motor and fine motor skills, participate in fitness activities, with an emphasis on spatial awareness and balance through cooperative games, rhythm and Physical Fitness. 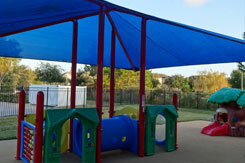 We also promote free play and socialization during supervised outdoor play sessions. 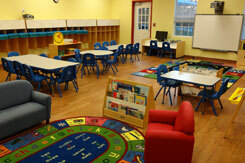 We incorporate Technology into our curriculum in our three and four year old classrooms. There are a number of specialized programs that allow children to get a multimedia presentation of content so that they can better understand and process the material. They are able to see the written words, see a visual image and hear the sounds — all at the same time. Combining these sensory modalities helps a child to more efficiently internalize information about a topic. Children are encouraged to learn computer techniques by using the computers regularly through supervised sessions with interactive, educational games. 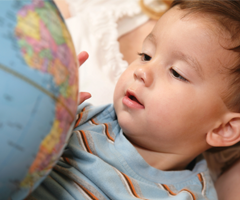 Children gain exposure to a Foreign Language while developing their vocabulary through hands on activities, games and songs. 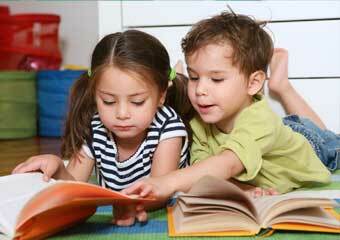 Spanish is integrated into the child’s daily learning experiences and related to the daily and weekly theme. Nurturing an appreciation for music and the arts is an integral part of our daily curriculum. Through our Music and Drama program we introduce the children to an array of energetic songs, finger plays, and nursery rhymes. 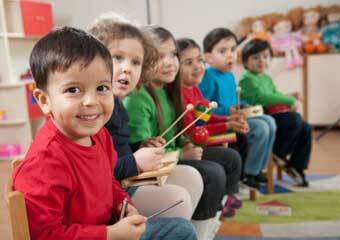 Our Music classes will allow children to play instruments and learn about rhythm, tempo and beat. We will expose them to many genres including traditional, folk and classical music. They may even create instruments to play in their own marching band, and of course everyday is a sing-a-long. In Yoga class the children learn a variety of poses that promote body awareness, self-esteem, and social awareness while enhancing flexibility, balance, strength, and coordination. In this fast-paced world, yoga offers children an outlet for reaching relaxation and calm through enjoyable, non-competitive physical activity. TeachSmart by Hatch is an interactive whiteboard that is easy for teachers, child-friendly and provides an optimal learning environment for lasting results! Children enjoy exploring fun and engaging curriculum while educators benefit from efficiency improvements gained from our proprietary activity planning and content management solution.